I’m Flattered… My First Copycat! I’m not going to call out the individual who did the copying, nor am I going to post a link. I have not contacted the copycat or anyone else on the matter. I’ll explain below why I believe it’s not worth arguing or wasting energy disputing the existence of a copied item – especially when no copyrights or trademarks exist. Instead, the incident has inspired me to write my thoughts on the subjects of copying and originality. The primary apparent difference between my version and the copycat’s version is in our attention to detail. I spend a lot of time on minute details, and use every relevant technique I know to add polish and flair to my creations. Proper edging takes.. ages.. it’s a multi-step process to sand, burnish, and polish to give the piece a beautiful finish. I use the smallest tools available to add as much detail to the carving/tooling as I can, often resorting to a fine stylus for components too delicate for any other tool. I take great pride in my creations, knowing that each design came from the recesses of my mind, and often evolve over several sketches before they come to leather fruition. One could argue that no one’s art is truly original: that all designs are influenced in some way by the work of others that we see in our day-to-day lives. The argument about originality is a philosophical one. My take is that artists can be influenced and inspired by the world around them and other artworks they see, and yet still create something personal and original having built upon these influences as a foundation. 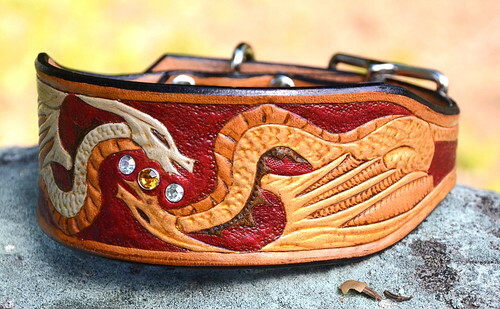 Using myself as an example; I did not invent the concept of a dragon, yet I created a dragon-themed tooled collar that I consider my own original art. I probably drew from my memory other artists’ depictions of dragons while composing my preliminary sketches. I’m not aware of anyone depicting my design of dragon in any way, on leather or otherwise, thus to me it is an original work of art. While it is possible for multiple artists to develop the same idea independently of one another, it’s not something with a high enough probability for the argument to hold much sway, particularly when multiple components are identical. In this case, my item is listed at $75, and the “copycat” has listed their item at $45. Considering that the cost of materials is about $15 (including the sales percentage to the payment processor, shop fees, and the costs of good quality leather and hardware), and it takes me about 4 hours of cumulative work (including communicating with a client through to crafting the item and shipping it off, and excluding the original concept development and design time) to complete this item, a profit of about $7.50 per hour just doesn’t make sense in the long run. When I sell one of my creations at $75, that translates to an hourly commission of $15. Keeping in mind that I (currently) do leatherwork for fun, and use the proceeds of my sales to buy and upgrade my tools, equipment, and other supplies, my sales numbers seem quite reasonable. This is not withstanding the possibility of having copies mass produced in another country, though that will likely be the subject of a future post as I gather more information on that topic. Many online sellers would get their proverbial knickers in a knot at seeing one of their creations blatantly copied. I admit that my initial reaction to seeing the listing was a (brief) moment of outrage, until I gave some thought to what being copied means to me as an artist and small-time online seller. 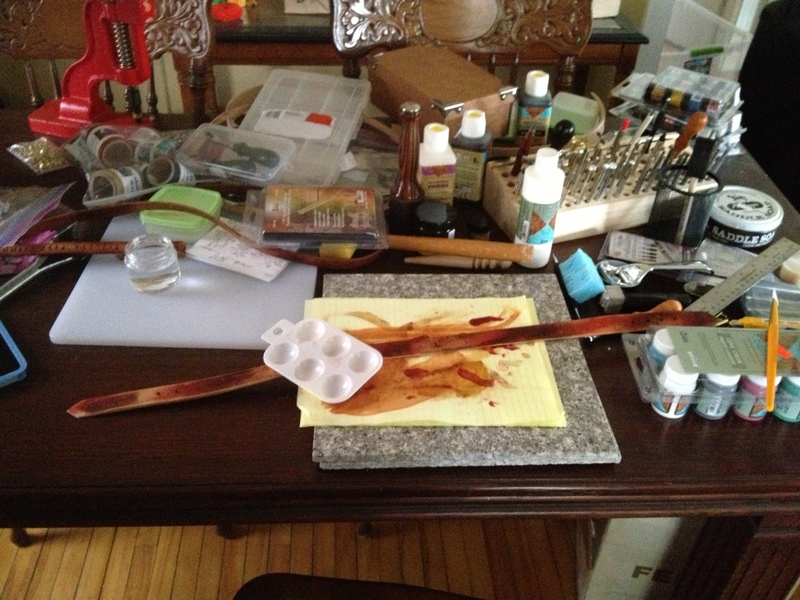 As an artist, I have a very active imagination. I have more ideas than I have time to craft them, even if I did this full-time instead of as a hobby. Sometimes an idea comes to reality, and I’m limited in how many new artworks I can produce despite my seemingly bottomless pit of ideas. I take joy in watching an idea unfold, evolve, and the process by which it becomes an artwork that I can proudly put on display. When I put my art on display, it stands to reason that the possibility exists that my creations could become the influence or inspiration of other artists, or “artists” (note the quotation marks). When I see that someone has not added any of their own creative energies to an idea or concept from another artist, I cannot help but feel sorry for them. They are missing a key component to what makes creating art so rewarding. Maybe someday, they will develop the skill, talent, and drive to create something of their own, but for now I’m sure that the satisfaction that they get in copying an item doesn’t compare to the feeling I get when I come up with a novel new concept, craft it for the first time, and have someone express their appreciation for my skill, work and efforts by purchasing one for themselves (or their pet)! Excellent! This just happened to me also, and it is very frustrating. But…also flattering to know someone liked my designs enough to copy them! Thanks for sharing. I know where you’re coming from, you should see the digital files world, it is a dog eat dog market. Copy, list and undercut everyone. I just wonder how can some shops survive on $2 sales including personalization! I totally understand your annoyance, especially over the price undercut. It creates the false impression that your work is overpriced, although anyone reading your narratives should be able to recognize your passion for researching the best supplies for turning out a quality item for long term use. All that study, plus developing a design concept before any tangible work is done, takes time. Not to mention integrity, on which one cannot place a price. That said, there will always be some degree of overlap in the basic look of certain designs by different artists. 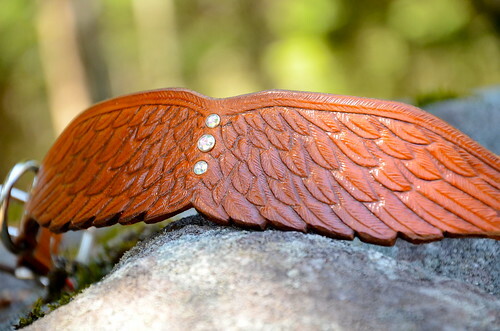 I bought a leather collar for my first Saluki about 30 years ago that was cut in the shape similar to your winged design and hand tooled in an overlapping feather motif. At the center point where you placed crystals was a pyramid shape dyed a different color from the wings. I’m sure your design in no way came from that artist’s work, just an example of how certain similarities can occur honestly. In the end, regardless of any superficial similarities, quality and integrity are self revealing. And a true artist will not consciously copy another’s work.